Thank you for buying Of Death And A Banana Skin. Some pages feature Augmented Reality. AR is new technology which brings a page to life with a tablet or smartphone. The camera in the device locks on to an image to trigger video, animations, readings or music. Register for the Acoustics Records Newsletter if you’d like to be kept informed of updates. 1. Download the free app HP Reveal for iOS and Android. Follow the instructions to create your own account. Click on the ‘Follow’ button. You may need to scroll down to find it. 3. Return to HP Reveal and tap the blue circle at the foot of the screen. The app will search for a ‘trigger’. Checking the list on this page, hold the camera over a specified area until it locks on. Once triggered, you can move the device away from the book and the content will continue playing. Tap the little ‘x’ in the corner of the screen to stop playback at any time. Please note! You need to be in daylight for this to work well. 4. Bookmark this page and check back occasionally as we add more AR content. This is still work in progress. Please use the contact link above to ask about availability. 14 – The Stick. Reading with music (The Middlesmoor Waltz). Scan the photograph on the cover of Simon holding a mandolin. 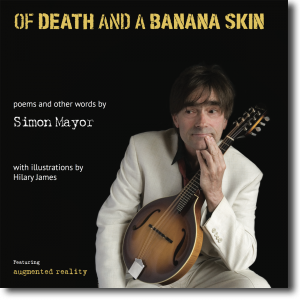 16 – Of Death And A Banana Skin On Ilkley Moor. Live Reading. Scan rocks at top of page. 18 – Fantasia On The Yorkshire Anthem. Animated playback of illustrations with music. Scan the banana skin. 24 – Low Mill. Reading. Scan strip of illustration on right. 29 – Queen Victoria Street. Animated playback of illustration with music (Ayre by Henry Purcell). Scan page. 30 – The Oracle. Reading. Scan strip of illustration on right. 31 – The Oracle. Animated playback of illustration with music (The Dargason). Scan image. 39 – Sumer Is Icumen In. Song (Sumer Is Icumen In) with images. Scan upper half of illustration. 42 – Black Swans. Reading with illustration. Scan the swan. 44 – Red Kite. Reading with animated playback of illustration. Scan the wing of the kite. 52 – Great Expectations. Live recording of Simon and Hilary playing Handel’s Arrival Of The Queen Of Sheba. Scan title text. 60 – Pigeon Pi. Live reading with animated playback of illustration. Scan pigeon at foot of page. 62 – Rogue And Rose. Song (Rosebud In June) with animated playback of illustration. Scan the head of the rose. 70 – Across The Pond. The story of ‘The Man On The Plane’ to a live audience. Scan the man with the gun. 80 – Fireflies. Song (Fireflies) with animated playback of illustration. Scan all the text on the left. 90 – Further Adventures Of The Stick. Reading with music (The Middlesmoor Waltz). Scan half image on right of page.